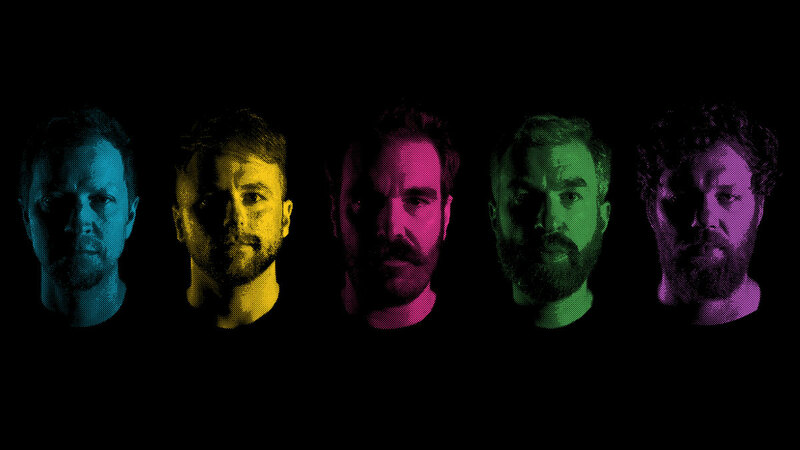 Red Wanting Blue, a rock and roll band whose music consists of raw, emotional vocals and melodies that are fitting to just about any mood you may be in for the day, has been around for over two decades and is continuing to grow more and more as the years go on. ReviewStl’s Samantha Davinroy recently had the privilege of speaking to Red Wanting Blue’s lead vocalist, Scott Terry. Terry took some time out of his busy schedule while tour along West Coast of the U.S. Terry discussed the band’s new album, how the band got its start and other topics. If you haven’t already, give their song “High and Dry” off their smashing new album “The Wanting” a listen. “When the band started in college, “Red Wanting Blue” just sounded like unwanted lyrics that couldn’t make it into a song, but the reason why we stayed with it was because they are primary colors, and one can never be the other. Yet, they are in the condition to try and become one another anyway. As human beings, we believe in alchemy. We believe we can turn lead into gold, and a lot of times, despite our limitations, we are determined. I mean, we don’t have the ability to fly, yet we made it to the moon. I feel like that resonates for struggling musicians who want to follow their dream, and everyone says that you can’t do it or you’ll never make it. We may know it might not work out, but we’re going to try anyway, and that’s the meaning of “Red Wanting Blue.” It’s going after what you’re not supposed to be chasing, but doing it anyway. The new album was very intentionally called “The Wanting” for that purpose and for that sentiment. Did the other members of the band help come up with the name, or was that primarily you? “No, that was all me. I take full credit for that. The band has been around since 1996, and the youngest member of the band has been in for about 10 years. So, the name was very early on. Everybody in this band makes up what this band is, but years and years ago when you’re first starting to figure things out, you just kind of throw a band together. You meet a drummer and you’re like “Oh really? You play drums? Well, I want to sing and I need a drummer so let’s start a band.” There wasn’t a big process, but this is when I wanted to start doing this for real. The band took awhile to form; it takes awhile to form that family. But, that’s why I get to take exclusive credit for the name because that was at the beginning of it all. How did you meet the other band members? When did you first know you wanted to do this as a career? What was the first instrument you wanted play? How would you describe your music in just three words? “Ulysses” talks a lot about what you would do for love, but what would you yourself do for love? With this new album, what were you trying to do differently, if at all? What message were you trying to put out there? What is the favorite spot to perform? Later on, Terry and I talked a bit about our favorite shows to binge. When he finds the time, he likes to watch Pounds for Pounds, Arrested Development, Parks and Recreation, and The Office. It’s nice to know famous road bands are real people like us who also enjoy binge watching every episode of The Office on Netflix. Scott Terry, along with the rest of his band, are down-to-earth people who have a dedication to their fans and their music. As Terry said, whether they take steps forward or backward, Red Wanting Blue is going to continue to do what they love most: create music. Red Wanting Blue is performing at Blueberry Hill in the Duck Room at 8 p.m. on Thursday, May 31st.